Even if your research is extremely meaningful, there is a high chance that most people outside of your field have never heard of it. Even if your study species is extremely endangered, unless it is a cute flagship species (think panda, elephant, rhino), there is a chance that many people including local stakeholders do not know much about it. The second most important pillar of your work as a scientist, right after producing good quality science, is to communicate your science with those who need to know about it. Social media is important, but in many cases you are ‘preaching to the converted’ as even on twitter someone will have to search #EndangeredSpecies or #Shark in order to find your post within the short period of its lifetime. Whenever we want to affect a status quo, we have two options: the top down approach and the bottom up approach. Both are equally important! For example, if we want to reduce the number of single use plastic bags in the system, we need to convince companies and governments to ban the bags (top-down), but we also need to work with consumers (bottom-up) who might otherwise unknowingly undermine a ban on bags by asking for single use plastic bags at the supermarket counter, thus creating consumer demand. One of the most effective, fun and rewarding ways of conducting outreach is to work with local schools. 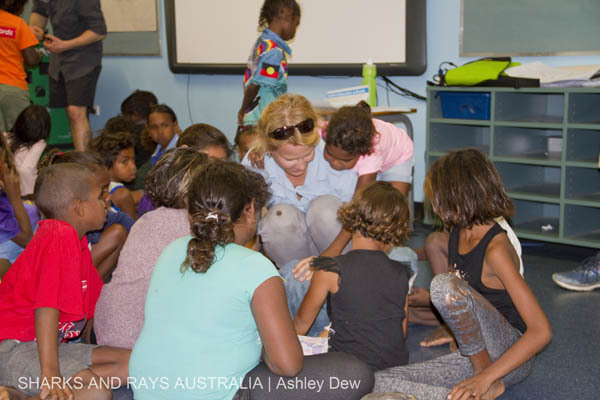 In the last year, which is also our second year of working with volunteers, Sharks And Rays Australia has finally commenced its outreach program in local schools. In an area the size of Germany, that is only inhabited by 28,000 people, a handful of visits in local schools mean that we were able to speak to almost 1% of the population during these school visits, and 4% of all inhabitants under the age of 14. 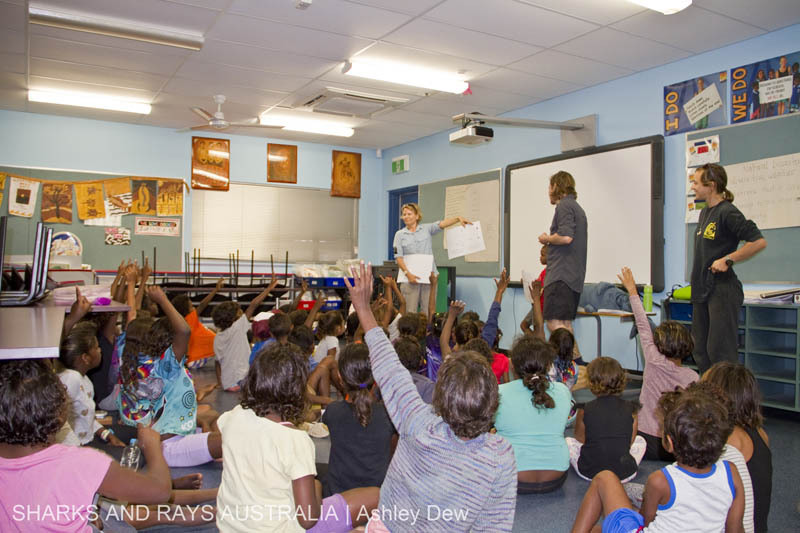 During our school visits in Aboriginal communities, we do not ask children about the traditional uses of sawfish. Under Native Title law, Indigenous Australians are allowed to capture and eat sawfish for personal consumption only. Many Indigenous Australians are protective of their customs and we respect that. But already the simple question of “Hands up if you’ve ever seen a sawfish!” can provide quantitative insights into current abundances of these animals. 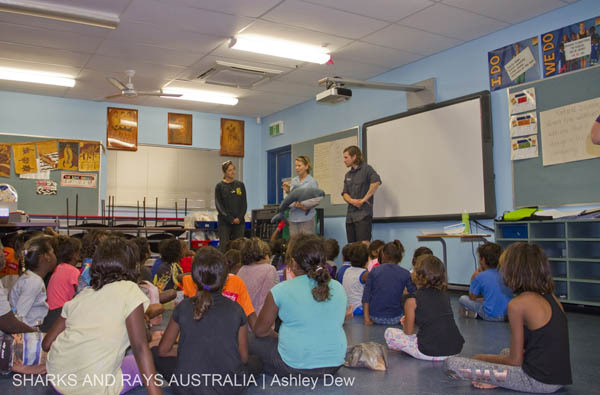 In one of the schools, around 90% of the kids had seen a live sawfish before! 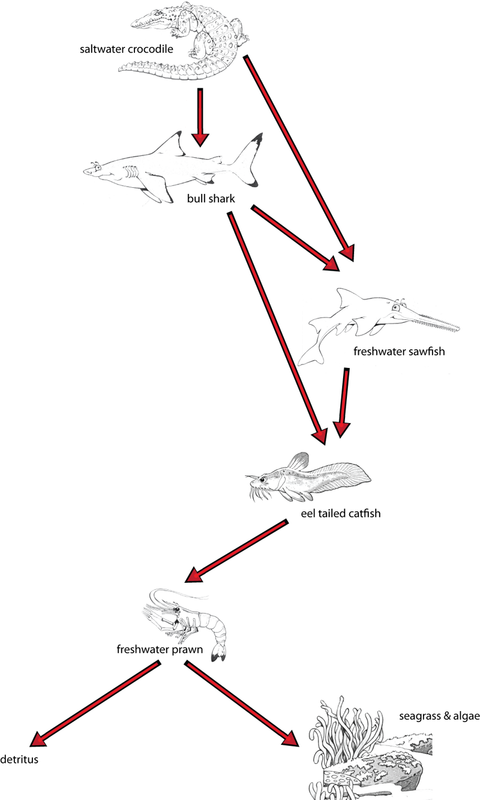 After we have explained to the kids what sharks, stingrays and sawfish are and why they are in trouble around the world, we play a game with them, the Food Web Game (download it for free here https://www.sharksandraysaustralia.com/SARAFWG1-4.pdf). The game uses local food webs of species that the children know. While the kids colour in the sheets, we explain some of the cool facts about each species to them. Afterwards the big question is who eats whom and once that is established, we pick an animal out of our food chain and ask the kids what happens if this species is overfished, thus teaching them about the importance of maintaining a natural balance. So far, the feedback has been incredible. 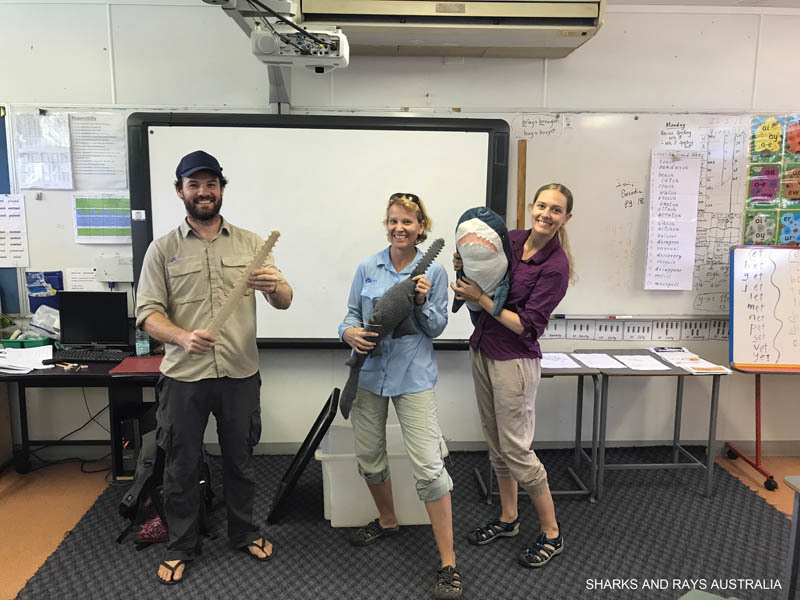 The volunteers are stoked to meet the locals, the kids love it, and so do the teachers, as our visits provide the kids with a real world insight into the classroom science they are taught. I personally hope that the presence of female scientists in their classroom will also help some of the girls to realize that STEM science is not for boys only.